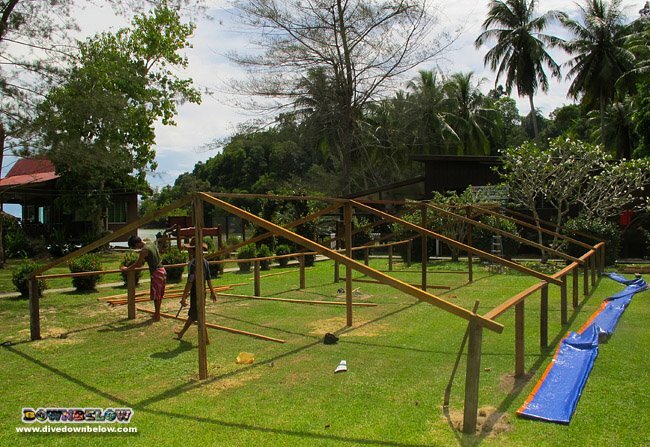 Soon it will be Group Season here in the Tunku Abdul Rahman Park in Kota Kinabalu, Borneo and preparations are well underway. Our PADI 5 Star IDC Dive Centre on Gaya Island is an increasingly popular destination for groups of all sorts, from adventure to universities and schools – all out for diver training, ecological research & education and just some good old team building fun. We accommodate big groups who are spending multiple days on the island with a temporary construction of a communal living area, equipped with hammocks to sleep in and mozzie nets under cover from the elements. Not only is this a great outdoor experience, but there are few things that can beat waking up on a tropical island to the sounds of the jungle. Contact us for team building or group training and outdoor adventure experiences in Sabah, Borneo and we’ll tailor the best way to introduce your group to the splendors of the Borneo jungle. Have a look at our Adventure Group photo album to see what previous groups have experienced.